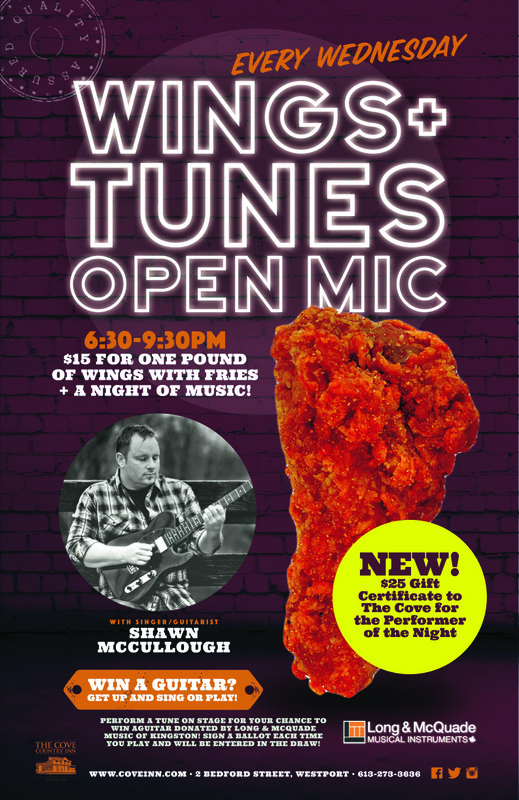 If you’re looking for some music to spice up your time in Westport, The Cove is the place for you to set yourself down. We bring in the best we can find and keep a healthy mix on rotation. From Blues to Jazz, Rock to Folk, Country to Bluegrass, Soul to Funk, we love it all. 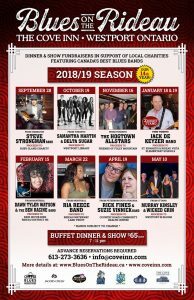 In the warmer months, larger performances and full band shows take place on our Lounge stage while solos, duos and small groups play to the patio crowds. When it gets cooler, all shows happen in the Lounge. To discuss a gig, please email info@coveinn.com with your name, number, email, web/social media links, particular dates you might want to play and anything else we might need to know about you. We appreciate your request but know that we can only book a limited amount of acts. Thank you for your understanding. Check out our CALENDAR of EVENTS below for the next show! 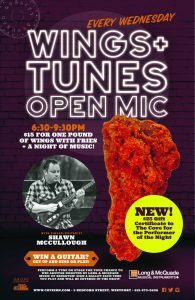 Master guitar player/singer/alternative lyricist/showman/songwriter Shawn McCullough helps you break up your work week and give you a little social fix. Shawn has played and toured with Canadian Country star Jason McCoy (The Roadhammers) and has been a part of Telecaster supergroup The Telebastards featuring Steve Piticco, as well as a member of DoubleBack with Wade Foster and John Wilberforce. He is highly in demand as a session musician and sideman for his incredible skill, wit and stage presence. He has a solo record to his name “This is Me” and is currently performing with rising CMAO and CCMA nominated Country star Brea Lawrenson! Thanks to Nate and everyone at Long and McQuade Music in Kingston, you can win an acoustic electric guitar if you get up and perform a song! Sign a ballot and you are good to go! THE GUITAR DRAW will happen on Wed.Oct.3 and you must be present to win! Choose The Blues Productions in co-operation with The Cove Inn, Westport is pleased to announce the 2018/19 LINE-UP for Blues On The Rideau @ The Cove – our 14th year! In memory of Diane Leduc Doran this year’s Series is being dedicated to her. BOTR @ The Cove is now recognized as one of the premier Blues Series in the country featuring some of Canada’s best Blues, Soul and R&B artists (all Juno, Maple Blues Award, Western Canadian Music Award and/or Quebec Lys Blues Award winners/nominees). The Cove venue is friendly and intimate located in a beautiful 140 year old country inn in one of the most scenic villages in eastern Ontario – Westport – located on the shores of Upper Rideau Lake on the historic Rideau Waterway (a UNESCO World Heritage Site) – only a 1.5 hour drive from Ottawa, 45 minutes from Kingston, 2.5 hours from Syracuse, 3 hours from Toronto and Montreal. 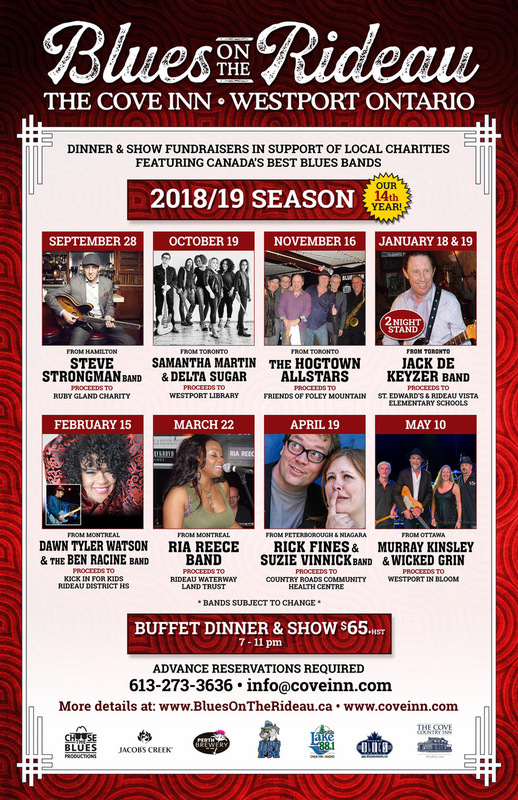 There are 9 shows this season including one 2 Night Stand – Jack de Keyzer in January. All shows take place from 7-11 pm. The ticket price remains the same – for the fifth year in a row – $65 (plus HST). That includes a delicious full course buffet dinner, dancing, door prizes and a chance to win 2 Grand Prizes at the end of the season. Proceeds from each show go to support different local charities. To date $68K has been raised for the Westport community and the goal is to raise at least another $5K this season. Advance reservations are required for all shows and can be made at The Cove, by phone 1-888-COVEINN 613-273-3636 or email info@coveinn.com Well priced accommodation is available at The Cove and nearby B&B’s and a motel but book well ahead. All the beds in Westport usually sell out on BOTR nights.